An original poster for MGM's blockbuster 'The Big Parade' (1925). Looking for something different to mark Independence Day? Then march on over to the Somerville Theatre in Somerville, Mass., where I'm doing live music for a screening of 'The Big Parade' (1925) in 35mm on Sunday, July 5 at 2 p.m. Despite now being 90 years old, this amazing movie—all about American soldiers who ship off to Europe to join in World War I—has lost none of its emotional impact. Directed by a very young King Vidor, the film set new standards for realism in the then-still-new medium of cinema. It was the 'Saving Private Ryan' of its time, as mentioned in the press release below. The result was an enormous blockbuster for MGM, which had just been created by a recent merger. 'The Big Parade' caused a sensation, becoming the studio's highest-grossing picture up until 'Gone With the Wind' hit the screen in 1939. What I like most about 'The Big Parade,' and what I think still works just as intended, is its very simple but powerful structure. Vidor directed the first half of the film in the style of a light romantic lark. We follow the GIs into the French countryside, where they bunk together in barns and get to know one another—and we get to know them. Plenty of hijinks ensue, including flirting with the local women, with no shortage of humor. It's kind of like a Sad Sack comic book story come to life. That's John Gilbert under the barrel, getting to know a French village gal played by Renée Adorée. But then the men get called up to the front, and everything changes. Vidor takes the men we've gotten to know and marches them into the trenches, and we can't help but be pulled along with them. We're suddenly in a world of darkness and mud and giant explosions and shrapnel and death everywhere. In the trenches: John Gilbert surrounded by comrades Tom O'Brien (left) and Karl Dane. Who will make it? Who will not? I've accompanied this film many times now, and the structure never fails. You get to know these characters, and then you're tossed into the trenches with them. Everything is suddenly more intense, more vivid, more urgent, and more real. It's as if you wake from a dream but then get caught up in a nightmare. Vidor not only brought you visually into places most audiences had never been taken, but his structure helped mimic the emotional landscape of battle. His structure helps us feel at least a little bit of what it's like to be part of a group now facing danger in a strange land for a cause that may or may not be worth fighting for, despite your duty. With this in mind, it's a great film for music. To help underline the contrast, I've found it works well to score the whole first half as if it's one of those Sigmund Romberg operettas—a fanciful European fairytale. Then, in the second half, I shift to an entirely different and much more aggressive style of accompaniment to communicate how things have changed. To me, the point where there's no turning back is the scene when the soldiers emerge from a forest and move out onto a blasted battlefield that's under continuous shellfire. No more Romberg from then on, folks. 'The Big Parade' is sometimes called the first "anti-war" film, but I think that's overemphasizing one aspect of it and putting it into a box in which it doesn't fit. Rather, I think it celebrates the whole complex experience of being an American and serving one's country. And I can't think of a more satisfying way to finish a weekend of fireworks celebrating our nation's birth. So come see 'The Big Parade.' More info about the screening is in the press release below. Hope to see you there! P.S. Interesting trivia about 'The Big Parade'...renowned painter Andrew Wyeth first saw the film with his father in 1925, sparking a life-long interest. In a 1975 letter to director King Vidor, Wyeth claimed to have seen the film more than 200 times! For more info, check out info on this lecture at the Farnsworth Museum in Maine, where I've been trying to program 'The Big Parade' for some time now. How about it, guys? The classic shot: John Gilbert and Renée Adorée in 'The Big Parade' (1925). SOMERVILLE, Mass. — It was the 'Saving Private Ryan' of its time — a movie that showed audiences combat as experienced by a soldier whose life is changed forever by the horrors of war. It was 'The Big Parade' (1925), a sprawling World War I epic and a box office sensation that made MGM into a powerhouse studio in Hollywood's golden years. It's the latest installment of 'Silents, Please!,' a monthly silent film series with live music at the Somerville Theatre. 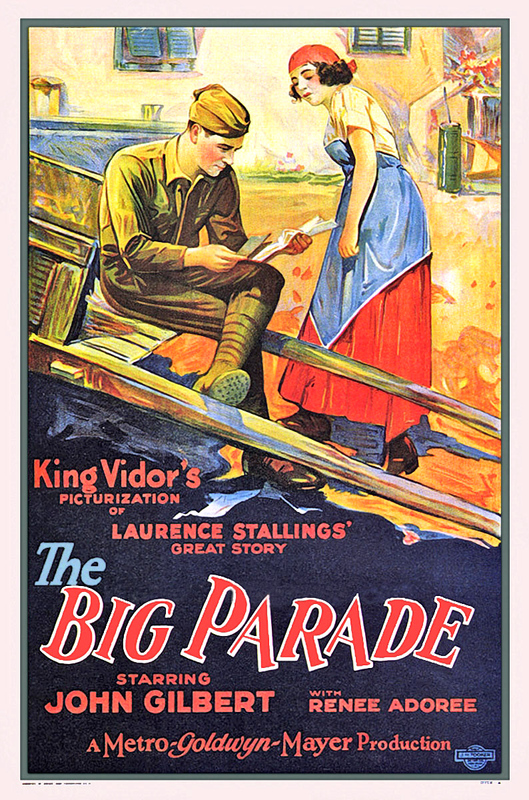 'The Big Parade' will be screened in 35mm one time only at the Somerville Theatre on Sunday, July 5 at 2 p.m. General admission is $15; seniors/students $12. 'The Big Parade,' released just a few years after World War I ended, was hailed by critics as the first Hollywood film to depict the harsh reality of combat and its impact of troops in the trenches and foxholes. Its hellish battle scenes were staged on a massive scale and still retain their ability to shock audiences. The picture, based on the best-selling novel "What Price Glory? ", follows the story of a young man (John Gilbert) who rebels against a privileged background by enlisting in the army just before the U.S. enters World War I. • Sunday, Aug. 2, 2 p.m.: 'Speedy' (1928) starring Harold Lloyd. Can Harold New York City's last horsedrawn streetcar line from the clutches of a greedy transport tycoon? The Big Apple co-stars in one of Harold's great silent comic masterpieces. Plus an extended cameo appearance from none other than Babe Ruth! • Sunday, Sept. 13, 2 p.m.: 'The Matrimaniac' (1916) starring Douglas Fairbanks Sr. An unusual program that contrasts this early Fairbanks marital farce with another picture released by the same studio after Fairbanks had moved on, but which uses material from the Fairbanks film to support an entirely different story. • Sunday, Oct. 4, 2 p.m.: 'Tramp Tramp Tramp' (1926) starring Harry Langdon, Joan Crawford. The great silent film comedian Harry Langdon returns to the Somerville's big screen, this time with a very young Joan Crawford playing his love interest! His debut feature finds Harry entering a cross-country walking race to save the family business and impress the girl of his dreams. 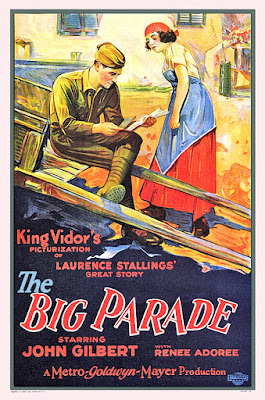 MGM's silent blockbuster ‘The Big Parade’ will be shown in 35mm and with live music on Sunday, July 5 at 2 p.m. at Somerville Theatre, 55 Davis Square, Somerville, Mass. A summer-long series of silent railroad films! All aboard the Arizona Express, departing at 4:30 p.m. sharp on Sunday, June 28. Last year, it was animals. The year before that, sailing ships. But this summer, our silent film series at the marvelous Wilton (N.H.) Town Hall Theatre will focus on trains. So all you foamers, mark those calendars: the series starts on Sunday, June 28 at 4:30 p.m. with 'The Arizona Express' (1924), a rip-roaring saga of the rails with enough mainline action to please any railroad fan. There's a press release below with more info about 'The Arizona Express' and other films we're showing in the series. 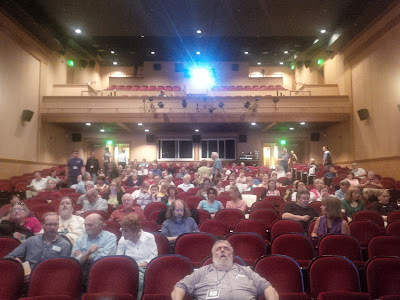 • A well-attended screening of 'Wings' (1927) on Thursday, June 18 at the Leavitt Theatre in Ogunquit, Maine. • A lively response to 'The Lost World' (1925) on Saturday, June 20 at Brandon Town Hall in Brandon, Vt.
• An unusual screening of 'The General' (1926) on Sunday, June 21 at the Aeronaut Brewing Co. in Somerville, Mass. The last one was scheduled as part of the first anniversary celebration of the Aeronaut, a sprawling craft brewery set up in a big old industrial space on a Somerville side street. It's quite a place. 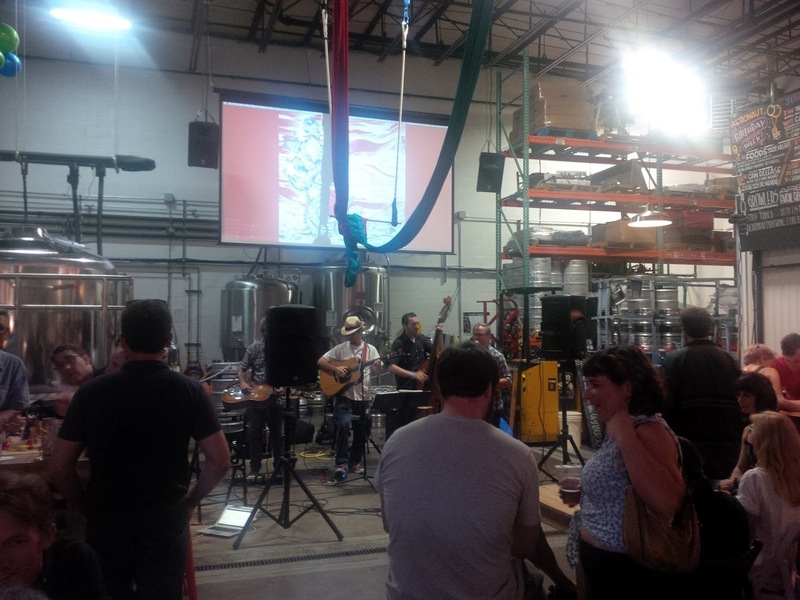 The brewery's symbol is the iconic image of a lawn chair with balloons attached to it; because of that, the warehouse space is festooned with lawnchairs with clusters of balloons hanging from the ceiling. But it's not just about the beer. (Which is great, by the way.) Owners Ben and Christine Holmes are developing the Aeronaut's cavernous home into a public art and performance space that features an ever-changing roster of musical acts, interpretive dance, and anything else that seems worth trying. 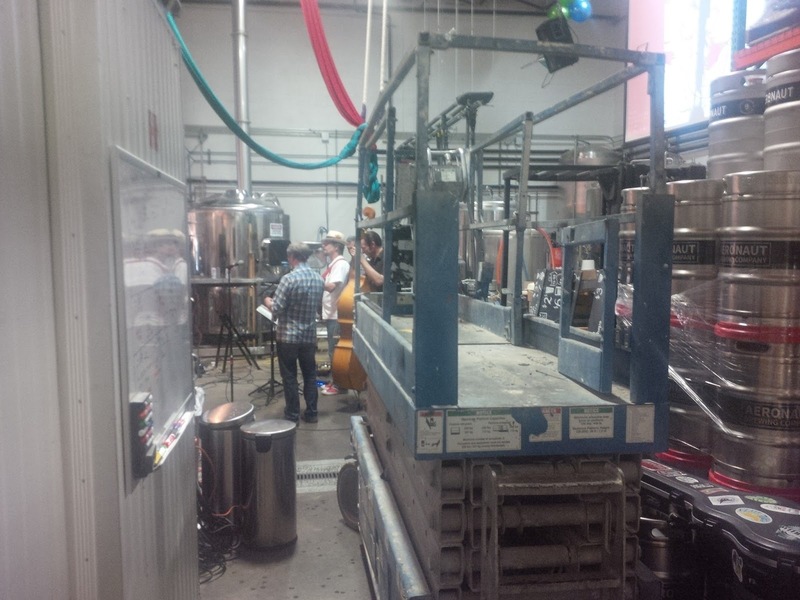 Even silent films with live music! And that's where I come in. Alas, before I came in, city inspectors came in, making a surprise visit to the Aeronaut, and ruled that if the film was shown where we'd planned to (an alcove off to one side), we'd be in violation of the Aeronaut's permit. A music group performing with the trapeze above. What to do? No problem: just show the film in the main room. Well, actually, one problem: the screen high above was obscured by a full-size trapeze and aerial silks hung from the steel girders high above. Would this be the first silent film presentation to be cancelled due to a trapeze? Well, nope—as it turned out, Ben had access to one of those mobile scissor lifting platforms that could be used to reach the ceiling. He piloted it from the loading dock down a narrow corridor, then raised it up to stow the trapeze and hanging silks in the rafters. This piece of equipment saved the day. I wonder what Buster Keaton could have done with one of these. 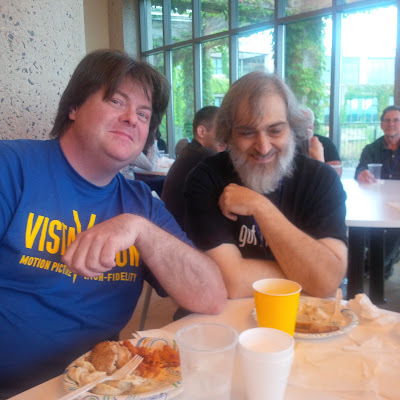 And so the show went on: Ben introduced me as "the improvisational composer," which I kind of liked. Good reaction to 'The General.' and there's talk of another show later this summer. We'll see. For now, I'm looking forward to our summer series of train movies in Wilton, N.H. For more information, please read on! 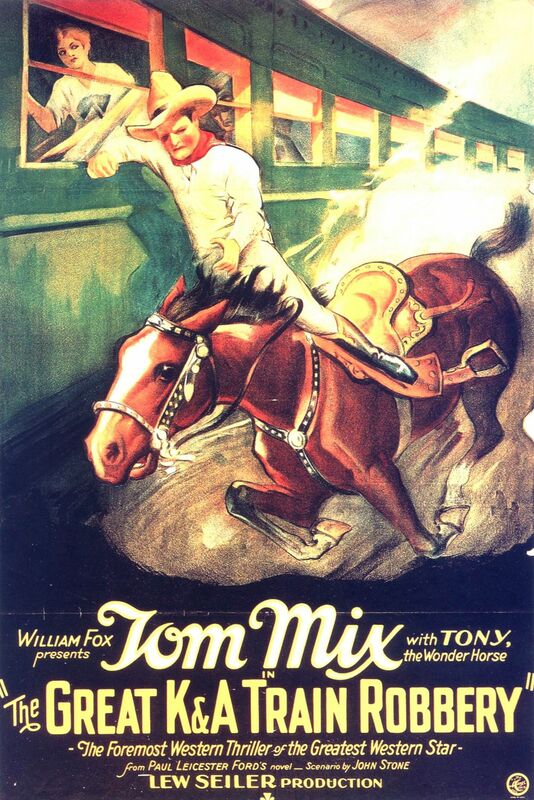 Tom Mix and Tony the Wonder Horse star in 'The Great K & A Train Robbery' (1926). WILTON, N.H.—If you like trains, get ready to climb aboard. A series of vintage big screen railroad dramas highlights this summer's silent film schedule at the Wilton Town Hall Theatre. The train-themed movies, all accompanied by live music, are fast-paced silent-era melodramas set in the world of big-time railroading. "These movies were made at a time when cars and trucks were rare, and railroads were a part of everyday life across the nation," said Jeff Rapsis, a New Hampshire-based silent film accompanist who will provide live music for each movie. "So the early studios capitalized on the public's close relationship with trains by churning out all kinds of railroad-themed pictures. In the silent era, it was a popular sub-genre," Rapsis said. The Town Hall Theatre's railroad series opens on Sunday, June 28 at 4:30 p.m. with 'The Arizona Express' (1924), a rip-roaring melodrama rarely screened since its original release. Other films in the series include silent cowboy star Tom Mix in 'The Great K & A Train Robbery' (1926) on Sunday, July 12; and the railroad crime story 'Red Signals' (1927) on Sunday, Aug. 9. 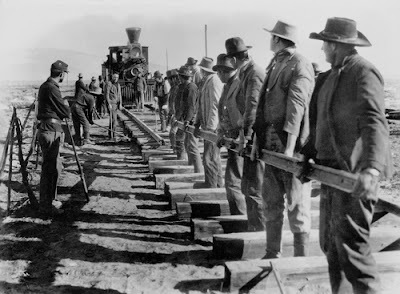 The series concludes on Sunday, Aug. 30 with 'The Iron Horse' (1924), John Ford's epic drama about building of the transcontinental railroad in the 1860s. 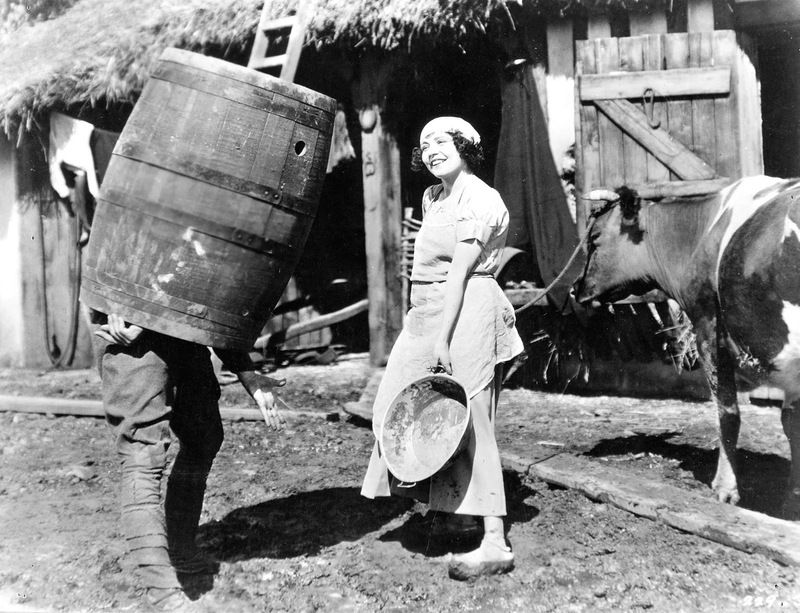 A scene from John Ford's 'The Iron Horse' (1924). All shows in the series start at 4:30 p.m. The Town Hall Theatre's screenings are free and open to the public; a donation of $5 per person is suggested to help defray expenses. Silent-era railroad dramas are of particular interest to train buffs because they're filled with scenes of working railroads in action about 100 years ago, at a time the nation's reliance on the rail network reached its peak. Each film in the series has been selected for its overall story quality and lasting audience appeal. "Even if you're not a railfan, each of these movies offers a great story told at a fast pace," Rapsis said. "These films were designed to be crowd-pleasers, and they still work today. They're the films that caused audiences to first fall in love with the movies." The Wilton Town Hall Theatre has been showing films since 1912. In addition to running the best current releases on its two screens, the theater remains committed to alternative programming such as its ongoing series of silent films with live music. 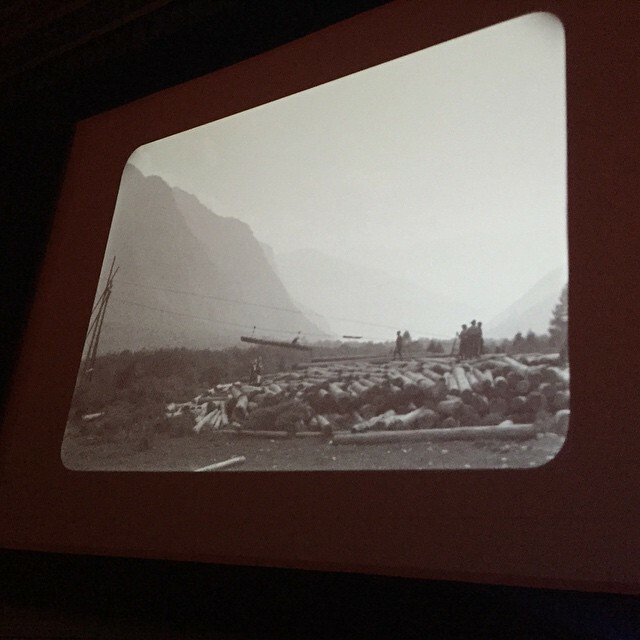 The silent series gives local audiences to experience great work of early cinema as it was intended to be seen: on the big screen, with live music, and with an audience. 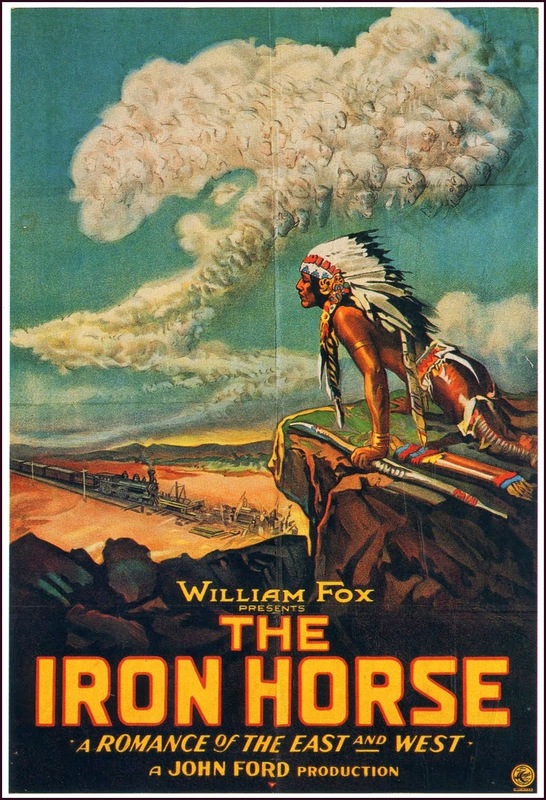 An original poster for John Ford's epic 'The Iron Horse' (1924). • Sunday, June 28 at 4:30 p.m.: 'The Arizona Express' (1924). We launch a summer series of train films with rip-roaring melodrama. When David Keith is sent to prison for allegedly killing his uncle, his sister Katherine must prove his innocence and get the information to the governor's office in time to save him. • Sunday, July 12 at 4:30 p.m.: 'The Great K & A Train Robbery' (1926) starring Tom Mix. Treachery on the rails as our hero goes undercover to learn who is tipping the bandits. 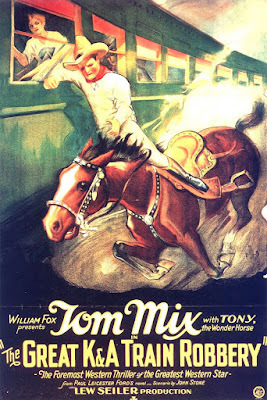 One of the best Tom Mix films, with plenty of action and some fantastic stunt work. • Sunday, Aug. 9 at 4:30 p.m.: 'Red Signals' (1927). After a series of train accidents in which the wrecks were looted, the railroad's top brass bring in "Sure Fire" Frank Bennett to set things right. • Sunday, Aug. 30 at 4:30 p.m.: 'The Iron Horse' (1924). 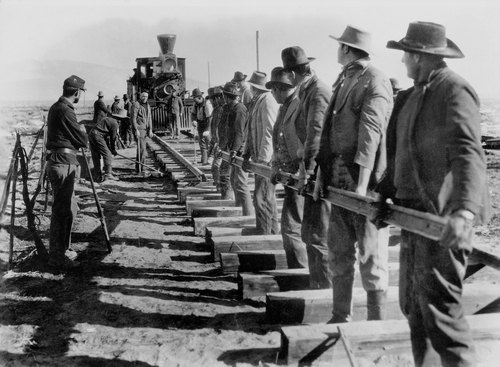 Director John Ford's sprawling epic tale about the construction of the Transcontinental Railroad. Highlighted by spectacular location filming in the wide open spaces of the Old West. 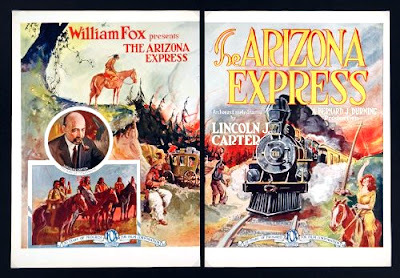 The Summer Train Film Series will begin with a screening of 'The Arizona Express' (1924) on Sunday, June 28 at 4:30 p.m. at the Wilton Town Hall Theatre, 60 Main St., Wilton, N.H. Admission to the screenings is free; a donation of $5 per person is suggested. My own photos of Mostly Lost in action were—well, mostly lost causes. This one is borrowed from accompanist Ben Model. What happens when you assemble dozens and dozens of unidentified film clips, and then run them in a theater full of vintage movie experts armed with Internet access? You get 'Mostly Lost,' a unique classic movie gathering—unique in that it actually encourages audience members to talk (the louder the better), check their laptops, and generally raise a ruckus, all while a film is running. The idea is that someone might be able to identify something on screen: an actress, a location, a detail that fixes a year or date. And often, that's enough for everyone else to start calling out suggestions or mining the Internet for more info to nail down the film's title. The thing is, it works! More often than not, a film is identified thanks to the collective brain power of some of the film community's biggest nerds—er, leading aficionados. And I've seen it in action, having just returned from attending the most recent edition of "Mostly Lost," now in its fourth year at the Packard Center of the Library of Congress down in Culpeper, Virginia. 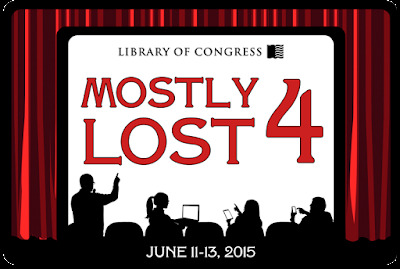 The full "Mostly Lost" is three days of film screenings and other events. But a tight schedule meant I could only make it down for the final day on Saturday, June 13. Even so, a visit to the Packard Center earlier this year (thanks, Rob Stone!) had me eager to see "Mostly Lost" in action. That, and a $59 round-trip airfare (that's no misprint) on JetBlue out of Hartford was enough for me get down there. And I'm glad I did. What really surprised me is how interactive the whole process is. Once the films start running, one after another, everyone joins in. And I mean everyone—not just the big-name experts on hand, but just plain folks of all ages. They all throw out suggestions, comments, corny jokes, and anything else that comes to mind. It's surprisingly refreshing—because, I think, we're so used to experiencing cinema as a passive art form. We sit, we watch. But at "Mostly Lost," we engage with the screen in a way that transforms movie-going into a collaborative effort. The view from my seat on Saturday during 'Mostly Lost.' That's Phil Carli at the keyboard at lower right. I think it's a close cousin to what an accompanist does in creating a live score for a silent film. The real-time involvement with the motion picture is engrossing, absorbing, and satisfying in a way that transcends cinema as a passive activity. Sessions are broken into chunks of roughly 90 minutes each, and follow a definite pattern. At first, we all stare at whatever footage comes up. Then invariably, someone recognizes something—often a performer, with a comment such as "that's the guy who played the orphanage director in Chaplin's 'The Kid,' but I don't remember his name. Then someone else remembers the guy's name, and soon the cross-referencing begins, checking cast lists against plot summaries against studio production lists, all online in various places. So it's like a crossword puzzle. Often, if you get one solid answer, you can fill in many other things based on that. And before you know it, the formerly unknown film now is now reconnected with its name, production date, studio, cast, and so much else. 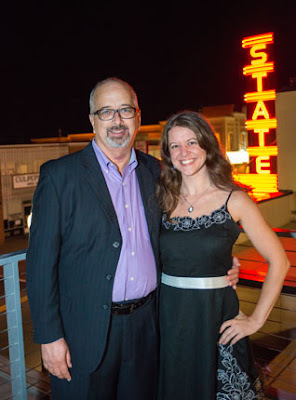 Chief organizers Rob Stone and Rachel Parker. At this year's Mostly Lost, selections ran the gamut from "Unidentified Auto Comedy" to "1917 Crime Melodrama." The Saturday session I attended included American films in prints from the Netherlands that sported Dutch intertitles that no one could really translate in real time. "GOUD IS LOKKEND EN MACHTIG," anyone? Still, almost all the films were positively identified via records of their original U.S. release. And even if what's on screen isn't entertaining, usually the commentary is. Few things are funnier than a room full of film experts watching footage of an unidentified travelogue from Verona, Italy that consists entirely of long sustained shots in which absolutely nothing moves. "I think I can see the ivy growing!" shouts accompanist Phil Carli, part of a chorus of increasingly irate comments. Speaking of which: nearly all the fragments are from the silent era, meaning the festival's three accompanists were kept busy. Carli was joined at the keyboard by Ben Model and Andrew Simpson, who took turns, swapping out for each film. They're among the best in the field, and one of the delights of the festival is hearing them create accompaniment for fragments of film they've never seen before, sometimes while also shouting out their own suggestions. Phil, it seems, has an encyclopedic knowledge of vintage autos, which comes in handy. Absent other clues, the shape of a car's running board can sometimes pinpoint when a film was (or was not) produced. If someone has a lot to say about something on-screen, the person is handed one of the wireless microphones and allowed to talk freely. That happened to me during another travelogue, which came to us identified only as scenes from Switzerland. When the footage screened, I was surprised to recognize scenes of the Landwasser Viaduct, a landmark structure on the mountain railway that links Chur with St. Moritz high in the Alps. Just last year, I had ridden on and photographed this line, and immediately knew what it was. The iconic stone viaduct soars over a deep gorge before plunging into a tunnel in the side of a vertiginous cliff face. The line as a whole is famous because of how it loops around and on top of itself several times to gain altitude as it climbs up the narrow valley. It looks a model railroad layout, but in real life! Accompanist Ben Model snapped this pic of the Swiss travelogue during Mostly Lost. So I started spouting off—and the next thing I know, I'm holding one of the wireless microphones and I'm narrating a vintage travelogue about Switzerland, drawing upon my arcane fixation with railroads as well as my half-assed knowledge of the mountain culture of my wife's people. And when that failed me, I resorted to stand-up, even though I was sitting down. "Here we see scenes of an Alpine logging operation," I remarked. "If this had been a sound film, right now you would undoubtedly be hearing plenty of yodeling." Accompanist Phil Carli immediately obliged by shifting the music into a bumptious folk idiom, topping it off with a scrap of melody from the well-known theme song to the "Swedish Chef" of Muppets fame, for which he apologized even before he'd finished playing the phrase. Wow! 'Mostly Lost' is a chance to catch up with folks such as film experts Bruce Lawton and Eric Grayson, seen here enjoying mostly lunch. As the day progressed, I expected to get a little antsy as the grind of fragments wore on. But that never happened. Instead, time flew, with each piece of film bringing the possibly of discovering something special or unknown. The atmosphere was buoyed, I think, by the energy of all that film nerd power in one place, and all focused on a single shared task. Think of it: Some of these people had been preparing 40 years or more for this moment! Plus, special presentations throughout the event broke things up. The day I was there, film buff Jim Kerkoff presented "Visiting Roach Royalty," a delightful account of his efforts to track down living ex-employees of Hal Roach studios during visits to the Los Angeles area back in the 1980s. Things were taken up a notch for public events in the evenings, for which "Mostly Lost" moved from the Packard to the marvelous State Theatre in downtown Culpeper. 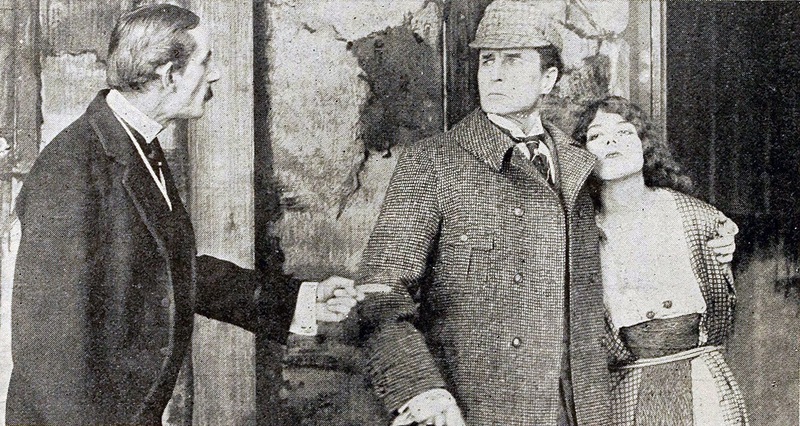 The night I was there saw the U.S. East Coast premiere of the newly discovered and restored 'Sherlock Holmes' feature film from 1916. The audience gathers prior to the 'Sherlock' screening. 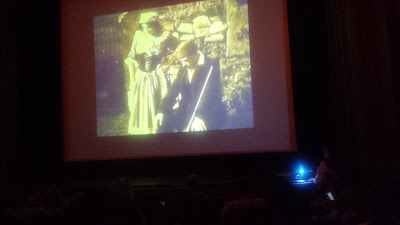 Restoration lead Robert Byrne (president of the San Francisco Silent Film Festival) delivered a well-illustrated presentation of what it took to rehab the single print discovered last year in the archives of the Cinémathèque Française. Then the lights went down, and we watched the film, with great live piano accompaniment from Phil Carli. A scene from the long-lost 1916 feature film 'Sherlock Holmes,' in which actor William Gillette played the role he made famous on the stage. And as it played out on the screen before us, I found myself marveling at how fortunate we were to be able to see a film considered lost for nearly a century. And yet here it was, with nary a scene missing and looking pretty darn good for a 1916 Essanay feature. 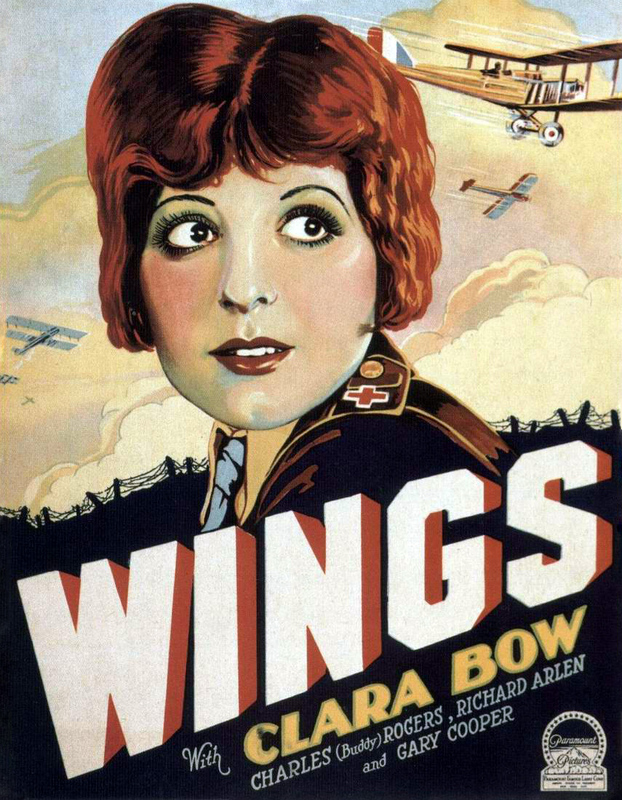 Warplanes menace the apparently enormous head of Clara Bow in this vintage movie poster. 'Wings' is all about biplanes, so perhaps it's fitting that in the next two weeks, I'll be accompanying two separate screenings in two different states. First up: the Flying Monkey Theatre in Plymouth, N.H. on Thursday, June 11. Then, a week later, it's the Leavitt Theatre in Ogunquit, Maine. 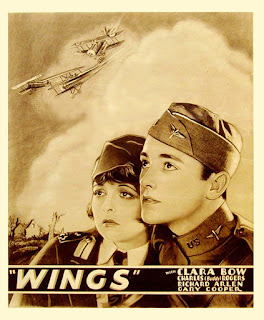 Both venues have movie theater roots dating back to the silent era, so it's possible 'Wings' played at either (or both) in its original release. But if you missed it in 1927, you have two chances to catch it this month. Hope to see you there! If you'd like more info, below is the press release that went out for the Flying Monkey show this week. I'll update it with the Leavitt's press release info after the Plymouth show. 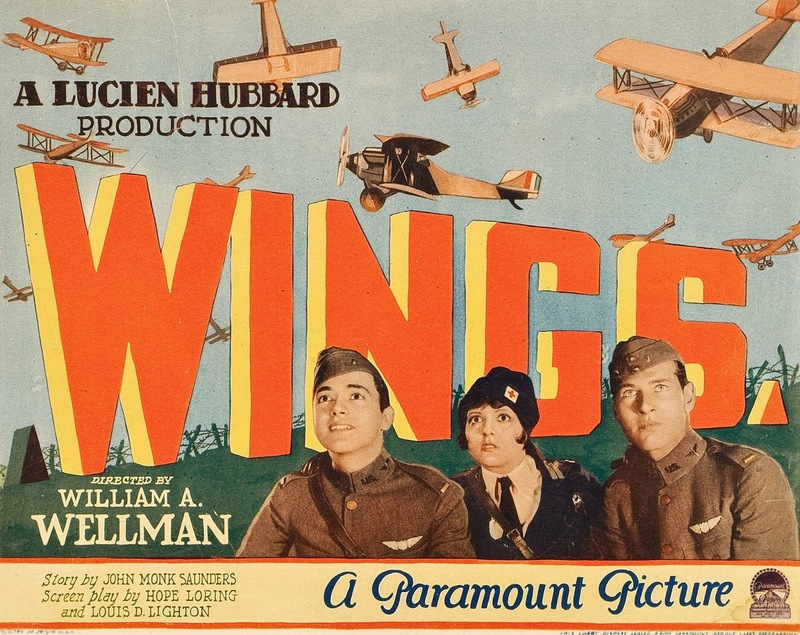 PLYMOUTH, N.H.—Silent film with live music returns to the Flying Monkey with 'Wings' (1927), an epic adventure set in World War I that won 'Best Picture' honors at the very first Academy Awards ceremony. 'Wings' will be revived for one showing only on Thursday, June 11 at 6:30 p.m. 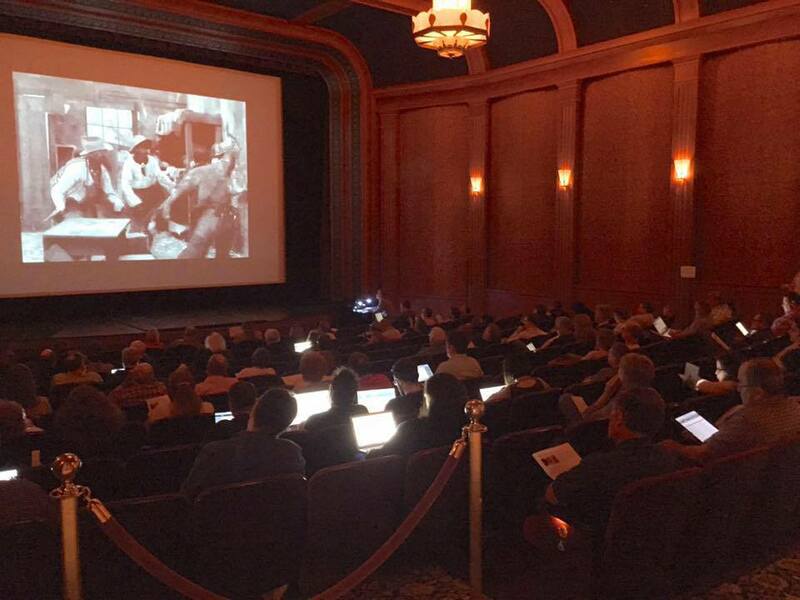 The screening will allow audiences to experience silent film the way its makers originally intended: on the big screen, with live music, and with an audience. The screening of 'Wings' will feature live accompaniment by Jeff Rapsis, a New England-based composer who specializes in creating music for silent film presentations. Admission is $10 per person. 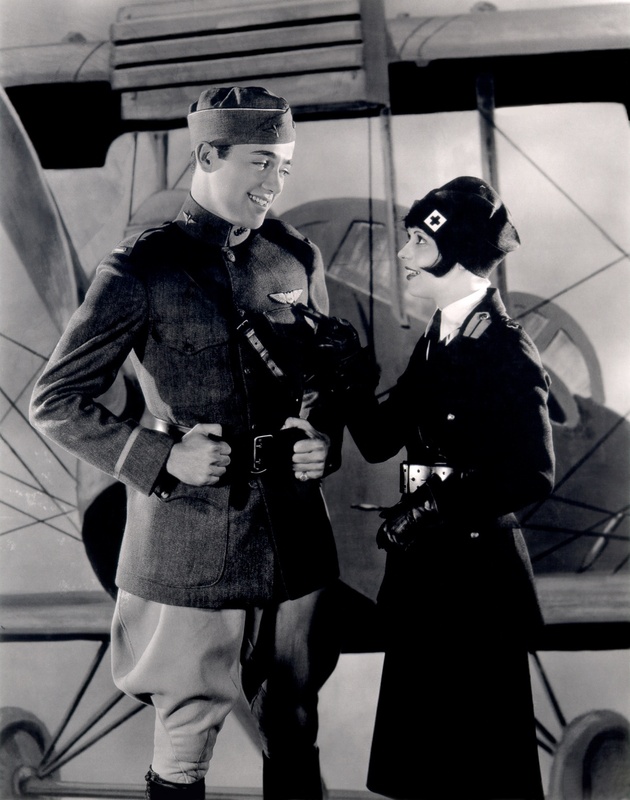 Buddy Rogers and Clara Bow in 'Wings' (1927). 'Wings' is about 2½ hours long and will be shown with an intermission. The film is a family-friendly drama but not suitable for very young children due to its length and intense wartime battle scenes. The Flying Monkey originally opened as a silent film moviehouse in the 1920s, and showed first-run Hollywood films to generations of area residents until closing several years ago. The theater has since been renovated by Alex Ray, owner of the Common Man restaurants, who created a performance space that hosts a wide range of music acts. • Thursday, July 9, 2015, 6:30 p.m.: 'A Dog Double Feature' spotlighting silent-era canine stars Peter the Great and Rin Tin Tin. In 'The Sign of the Claw,' a police dog helps solve a crime wave. The only surviving film of Peter the Great, a popular German shepherd performer. 'The Night Cry' (1926) finds iconic dog superstar Rin Tin Tin accused of killing sheep. Can he find the real bandit and clear his name? • Thursday, Aug. 13, 2015, 6:30 p.m.: 'Grandma's Boy' (1922) starring Harold Lloyd. A ccowardly young man must learn to conquer his fears before dealing with a larger menace to his community. Riotous small town comedy that helped propel Harold Lloyd into the most popular movie comedian of the 1920s. ‘Wings’ will be shown on Thursday, June 11 at 6:30 p.m. at the Flying Monkey Moviehouse and Performing Arts Center, 39 Main St., Plymouth, N.H. Admission $10 per person. For more info, call (603) 536-2551 or visit www.flyingmonkeynh.com. Next up: a double bill I've been looking forward to for a long time—at least since I found that the Library of Congress had circulating 35mm prints available of both titles. The two pictures are 'Play Safe' (1927) starring Monty Banks and 'Show People' (1928) directed by King Vidor and starring William Haines and Marion Davies. About the films: I'm very excited about 'Play Safe,' a film I've never scored before. In fact, I've never seen it in its entirety. We're running it part because of the incredible runaway train sequence that forms the film's climax. This famous footage has been excerpted for decades as a convenient way to demonstrate the power and excitement of silent film at its very best. But the entire film doesn't often get shown, and I'm not sure why. It could be because leading man Monty Banks never made it into the Chaplin/Keaton/Lloyd pantheon of silent clowns. I've heard varying reports of how well the film holds up as a whole. So we'll just have to see for ourselves, won't we? I'm also excited about 'Show People' (1928). More than any other silent picture I know, it captures the spirit of life in Hollywood in the 1920s, at least the way the studios wanted the public to think of it. One of the last silents released by MGM, and directed by King Vidor at the height of his career, 'Show People' stands as a Valentine to an era that was quickly coming to an end even as it was in production. Hey! There's Charlie Chaplin with William Haines and Marion Davies! Because it's all about Hollywood, 'Show People' is a very "meta" picture. At one point, Marion Davies (playing a star-struck would-be actress) has a chance encounter with the great Hollywood star...Marion Davies. At another point, a movie theater is screening 'Bardelys the Magnificent,' an earlier picture directed by King Vidor—who just happens to be visible in the audience. And remember all those star cameos in 'It's a Mad Mad Mad Mad World?' The same thing was done 35 years earlier in 'Show People,' with everyone from Douglas Fairbanks to Charlie Chaplin popping up for brief appearances. At this writing, it's not certain which title we'll run first. Could go either way—so come to the screening and find out! I'm also excited because both 35mm prints are in pretty good shape. Below are excerpts from a print inspection report from David Kornfeld, the Someville's master projectionist and self-proclaimed "living dinosaur" (for his continuing advocacy of celluloid). PLAY SAFE (1927). Print is on acetate, from 1990, in virtually new condition! The density is good (not great). It's 1.33 (yay! ), except for "The End" title card which, weirdly, is 1.37 with a soundtrack. Go figure. ... Ive never seen this movie, but it has a reputation! Theres a train chase scene at the end which is supposed to be amazing! Come and see for yourself! SHOW PEOPLE (1928). Print is on mylar, from 2003, and is in like new condition! Not a splice, not a scratch, not a hint of wear! Density is very good. This one is 1.37, with a soundtrack (which, obviously, I wont be playing). It's marked "long version," so thats probably a good thing. The frame has been properly reduced (for once), so we wont be doing the Movietone crop. Okay, for more info about the films, check out the press release below. Just to try to give it a different angle, the press release played up the fact that William Haines was Hollywood's first-ever openly gay leading man. They're both terrific films, so don't believe that weather report calling for a perfect late spring day on Sunday. Forecasts, bah! I can say for certain that you'll have a good time at this Sunday's show at the Somerville. C'mon, who do you trust? 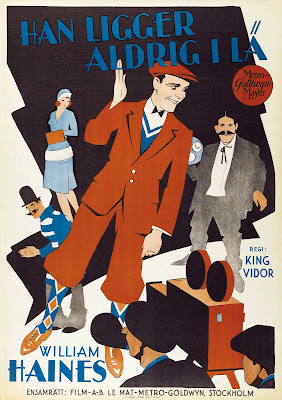 A Swedish poster for 'Show People' (1928) featuring William Haines. SOMERVILLE, Mass.—He was the Tom Hanks of the late 1920s: a leading man with a winning manner and breezy charm who always got the girl. 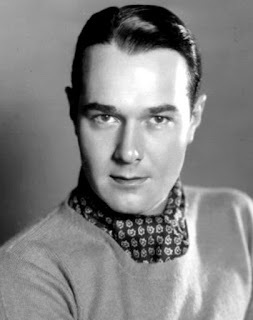 But the film career of William Haines, one of early Hollywood's brightest stars, was cut short for an unfortunate reason: at a time when sexual preference was a taboo subject, he was openly gay. See Haines at the peak of his popularity in 'Show People' (1928), an MGM comedy co-starring Marion Davies that spoofs the movie industry, pitting high drama against low comedy. Showtime for 'Show People' is Sunday, June 7 at 2 p.m. at the Somerville Theatre, 55 Davis Square, Somerville, Mass. The event also includes a screening of the silent comedy feature 'Play Safe' (1927) starring Monty Banks. Both films will be screened using 35mm prints from the U.S. Library of Congress. All are welcome to this family-friendly event; admission is $15 per person general admission. The screening, the latest in the Somerville's "Silents, Please!" series, will feature live accompaniment by Jeff Rapsis, a New Hampshire-based composer who specializes in creating scores for silent films. William Haines was one of MGM's biggest stars in the late 1920s, often playing the male lead in the studio's romantic comedies. But off-screen, Haines was gay—and, unusually for the era, he did not hide his homosexuality. This led to friction with his bosses. MGM studio chief Louis B. Mayer, convinced that movie audiences would not accept a gay leading man, urged Haines to keep his long-term relationship with actor Jimmie Shields a secret. Haines maintained his star status at MGM during the transisition to talking pictures in the late 1920s. But a publicity crisis arose in 1933, when Haines was arrested in a YMCA with a sailor he had picked up in Los Angeles' Pershing Square. Mayer then delivered an ultimatum: Haines had to choose between a sham marriage to an MGM actress to make himself acceptable to Middle America, or give up his career. Haines refused to submit, chosing to be himself rather than to pretend to be someone he wasn't. Mayer subsequently fired Haines, terminated his contract, and banished him from the industry. His movie career over, Haines recovered by launching an interior design firm, using his connections to become the most sought-after decorator in the Hollywood movie colony. The business prospered over the decades, with a client list of A-list celebrities as well as political figures such as Ronald and Nancy Reagan. Haines remained with his partner Shields for the rest of his life. Joan Crawford, who co-starred with Haines in several pictures, described the pair as "the happiest married couple in Hollywood." In recent years, Haines has been recognized as a courageous pioneer in gay rights in the early Hollywood community. 'Show People,' directed by King Vidor, shows Haines at the height of his leading-man status. The light-hearted story follows Peggy Pepper (Marion Davies), a beauty queen from Georgia trying to break into the movies as a dramatic actress. Haines plays Billy Boone, lead actor of a slapstick comedy studio where Pepper gets her first break. Can the young actress yearning for drama survive the indignity of pies in the face? When her big break finally comes, will it mean sacrificing her growing friendship with Billy? And can Billy rescue the fun-loving Georgia girl from a studio that aims to invent a whole new persona for her as a serious actress, descended from European royalty? Can low comedy win out over high drama? In answering that question, 'Show People' pokes fun at Hollywood phoniness and the culture of celebrity worship that had already emerged by the 1920s. 'Show People' also offers rare behind-the-scenes glimpses of movie-making at the very end of the silent period, when studios were rushing to prepare for sound. "It's like they knew an era was ending, and 'Show People' is kind of a Valentine to the whole silent film experience," said Rapsis, who will accompany the screening. "It's a love letter to all the craziness that went into creating the movie business." Set in backstage Hollywood, 'Show People' features cameos by dozens of major stars of the period, including Charlie Chaplin, Douglas Fairbanks, Sr., William S. Hart, and John Gilbert. In 2003, Show People was selected for preservation in the United States National Film Registry by the Library of Congress as being "culturally, historically, or aesthetically significant." 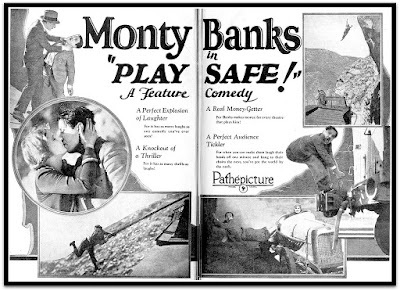 Also on the program is 'Play Safe' (1927), a comedy starring Monty Banks and Virginia Lee Corbin. 'Play Safe' includes an extended sequence set on a runaway train that critics have acclaimed as some of the most exciting filmmaking of the silent film era. The Somerville Theatre's 'Silents Please!' series aims to recreate the full silent film experience, with restored 35mm prints projected on the big screen, live music, and with a live audience. All these elements are essential to seeing silent films they way they were intended, Rapsis said. “At their best, silent films were a communal experience very different from today’s movies—one in which the presence of a large audience intensifies everyone’s reactions,” Rapsis said. • Sunday, July 5, 2 p.m.: 'The Big Parade' (1925) starring John Gilbert, Renee Adoreé. 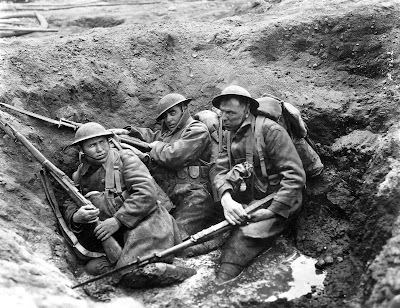 Director King Vidor's intense drama about U.S. doughboys sent to World War I France, where the horror of trench warfare changes their lives forever. Among the first Hollywood films to depict realistic battlefield action; still maintains its power to shock. 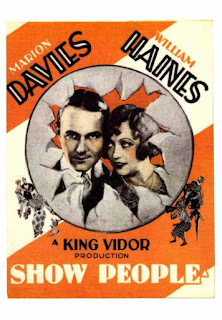 ‘Show People’ (1928), a classic silent comedy starring William Haines and Marion Davies, and 'Play Safe' (1927), will be shown with live music on Sunday, June 7 at 2 p.m. at the Somerville Theatre, 55 Davis Square, Somerville, Mass.